I had the wonderful opportunity to be interviewed by New Orleans food maven, Poppy Tooker on her nationally recognized NPR program, Louisiana Eats. I talk about my background in Judaism and how that relates to my personal cooking. The following blog post and recipe is reblogged with a link to the taped interview on the WWNO website. http://www.wwno.org/post/festive-chanukah-celebration. I am in great company! My friends Joan Nathan (author of Jewish Food in America) and Andrew Zimmern of Bizarre Foods on the Travel Channel (I’ll be on the DC Episode of Bizarre Foods America) also make appearances on this episode. Please be sure to check in often with Louisiana Eats to listen to the fantastic narratives out of southern Louisiana. Happy Hannukah! 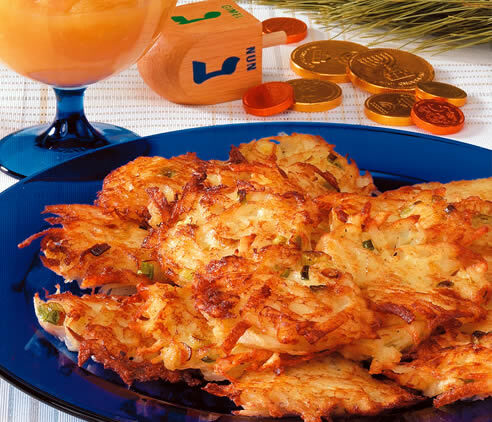 Since they’re prepared in hot oil, latkes are often thought of as a perfect way to commemorate the miracle of Chanukah. We’re celebrating Chanukah on this week’s Louisiana Eats! First, we’ll hear from Michael Twitty about the overlapping food customs between his African-American heritage and his Jewish faith. Then, Joan Nathan returns to the program to talk about Jewish culinary influences across the South. Plus, Andrew Zimmern recounts stories from around the world. Wring the potato shreddings in a cheesecloth, and repeat several times to extract as much moisture as you can. Then, in a medium bowl stir the ingredients together. In a large heavy-bottomed skillet over medium-high heat, heat the oil until hot. Most recipes call for between 350-375 degrees. Place a heaping tablespoon and a half of the potato mixture into the hot oil, pressing down on them to form 1/4 to 1/2 inch thick patties. Brown on one side, turn and brown on the other. Let drain on paper towels. Serve hot with an extra dusting of hot pepper and a few slices of green onion. These latkes can also be served with a dip like applesauce, sour cream, or sweet chili sauce.